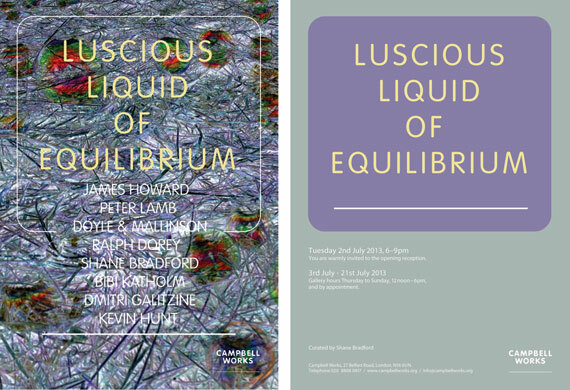 Luscious Liquid Of Equilibrium seeks to explore this feedback loop on a literal level, applying it to the proliferation of artistic production under the conditions of ‘the exhibition’. Utilising Gaia as a kind of curatorial template, each artist deals with the complexities of excess input on their own terms, whilst the exhibition (in turn dealing with the proliferation of artists) fuses them together in a self-regulating system of its own. The show, therefore, relies on the diversity of it’s content to ensure the continued stability of its context. This entry was posted on 22 June 2013 by Laurent Delaye in News, Peter Lamb and tagged Cambell Works, Contemporary art, exhibition in London, group exhibition, Laurent Delaye Gallery, Peter Lamb.